WWII veteran Milton Cohen wipes a tear as Colonel John Bowers announces the names of local war veterans. 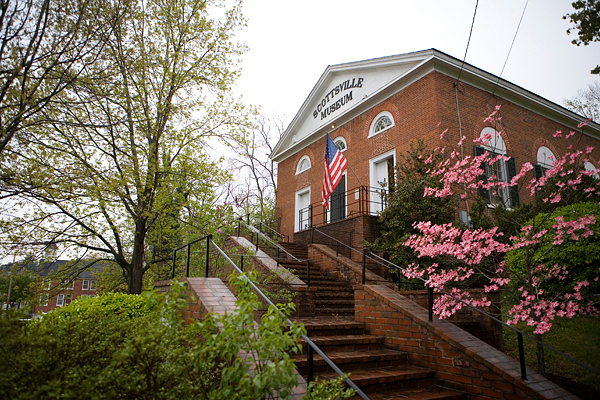 Saturday was the opening reception for Scottsville Museum’s annual exhibit. 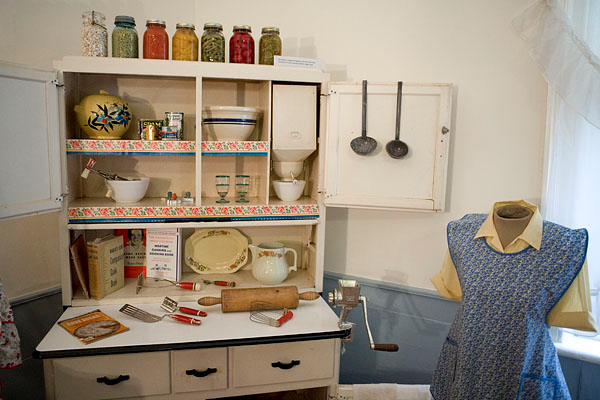 My mother is the president of this history museum in central Virginia, and she has been working incredibly hard for months to put together this wonderful exhibit. 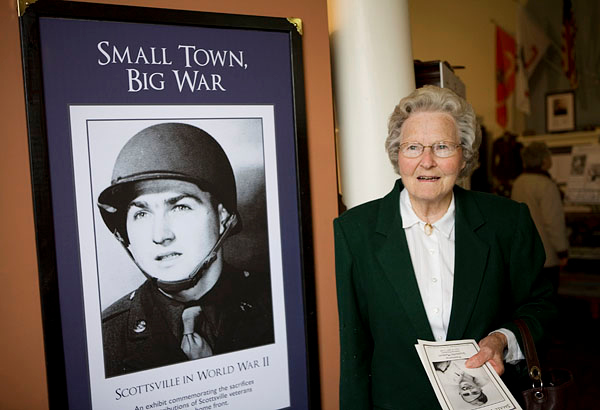 The exhibit focused on the impact of WWII on the people of Scottsville. 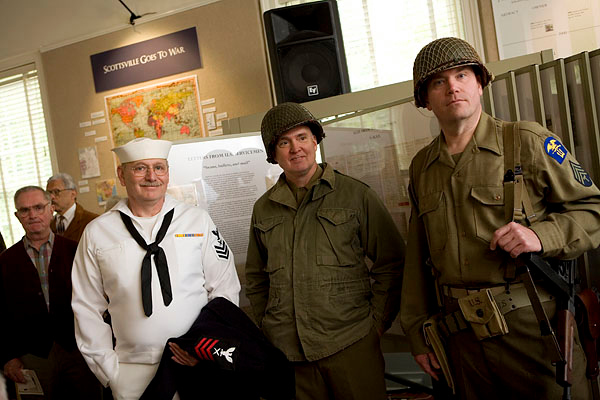 It featured several local veterans and families, and the opening ceremony turned out to be a highly emotional event. 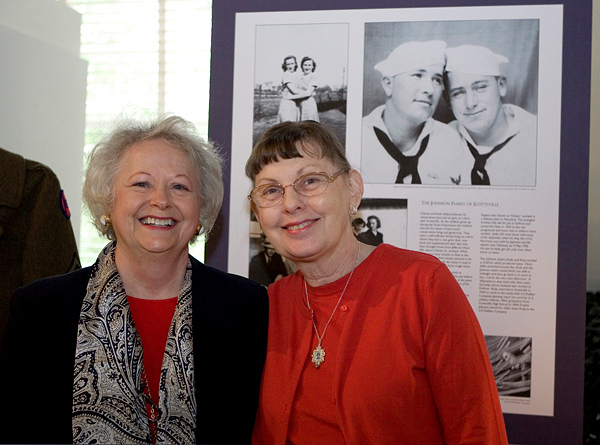 Several of the featured veterans and their families attended, which made the exhibit personal and heartwarming. 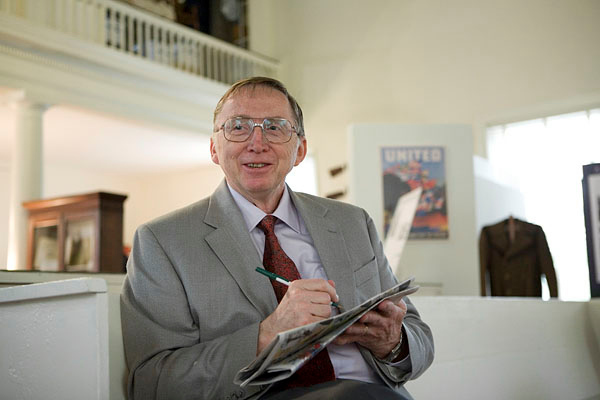 Even many people who were not directly involved in the war still talked to me with vivid memories of the time period, and I loved hearing everyone’s stories. 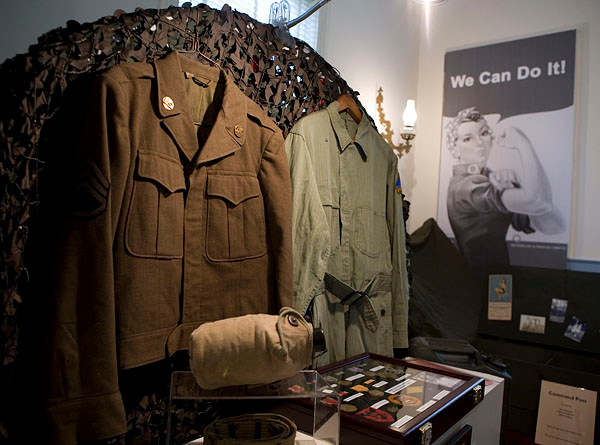 My father walked through the exhibit with me, and pointed out toys and foods that he remembers from his wartime childhood. 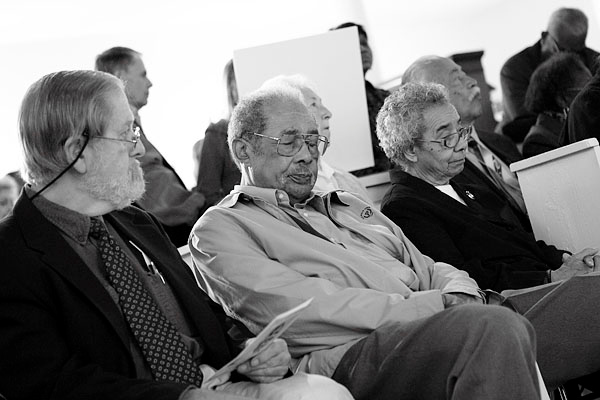 In the picture above, the front row of the seats were occupied by several WWII vets and their spouses. 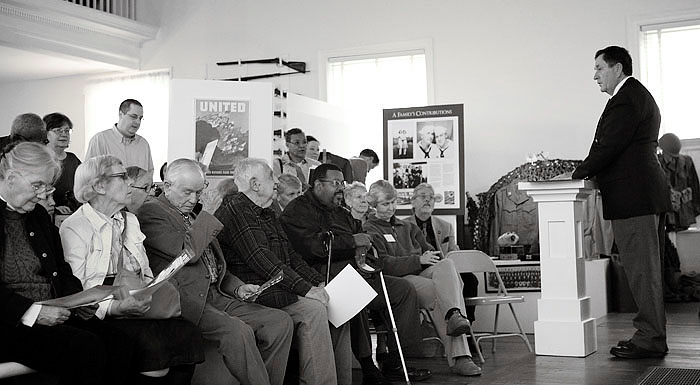 When the colonel announced the names of all the local WWII veterans, there was a palpable sadness as the museum guests remembered their friends and family from this small town. It was such an honor to witness. It was a rainy day, but that didn’t keep people away. Cousins Callie Bowers and Jill Harwood stand next to the photo of their fathers, Benjy and Gilbert Johnson. Benjy survived the war; his brother Gilbert did not. Jill met her father only once, when she was just nine months old. 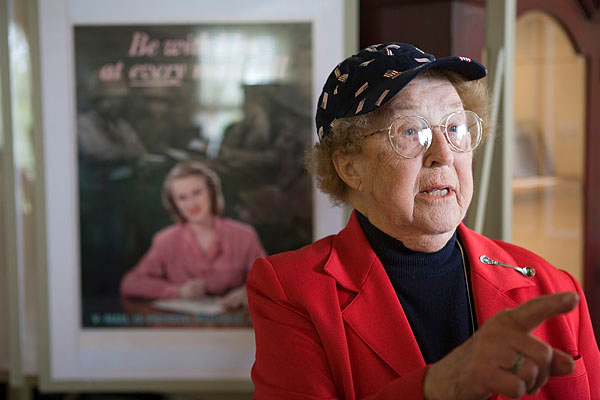 Jill has spent her life collecting photographs, newsclippings, and other memorabilia of the war and her father’s life. 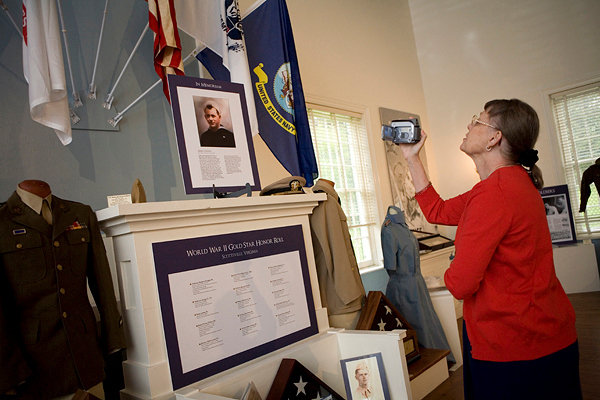 She bought a new video camera to record this memorial to her deceased father, and arrived several hours early to make sure that she didn’t miss a thing. 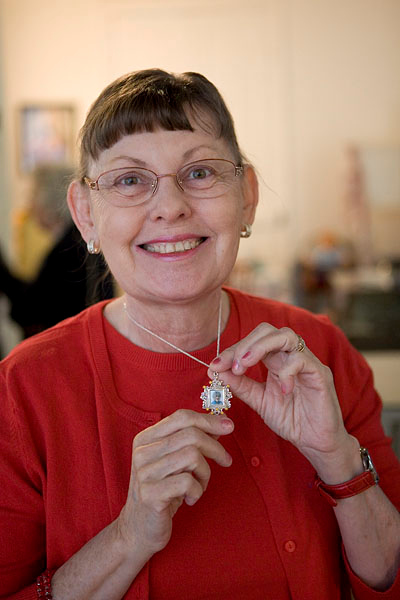 Jill shows me the photo of her late mother that she wears on her necklace. 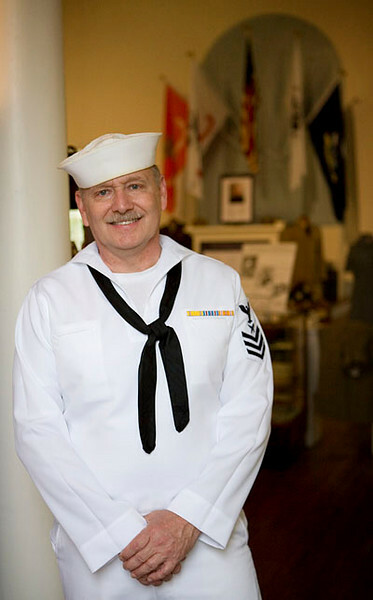 Earl arrived in a war-era Naval uniform. This war reenacter is named James Bond (really!) 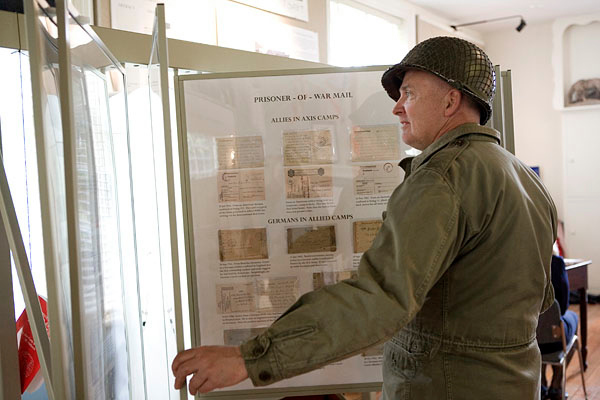 In this picture, Jim is reading the extensive exhibit that my father created about the mail system during the war. My dad did such a great job on this exhibit. 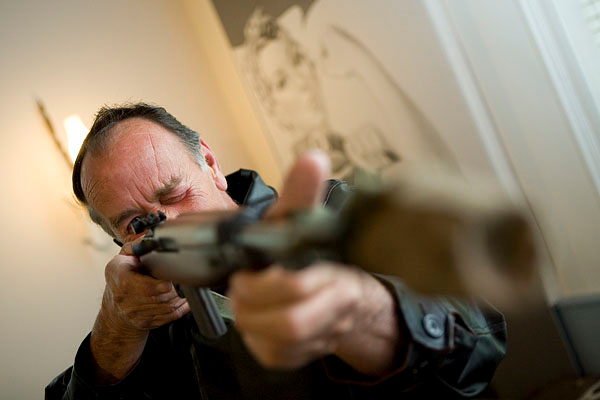 My father watches people admiring his exhibit. It was really well-received! 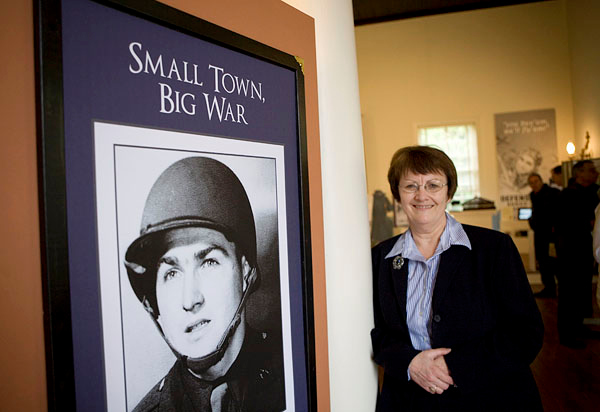 Margaret McGuire Duncan bore an uncanny resemblance to her brother, Benjamin McGuire, whose WWII photograph was displayed at the entrance to the exhibit. 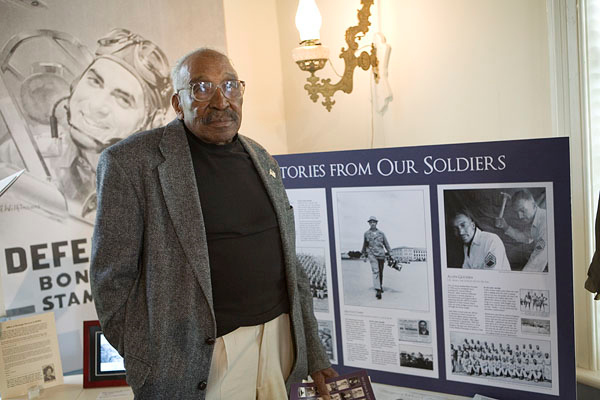 Veteran Allen Gooden stands next to an exhibit that featured his story and photos. You may remember that double-exposure from one of my earlier blog posts. I think it’s a really cool photo! 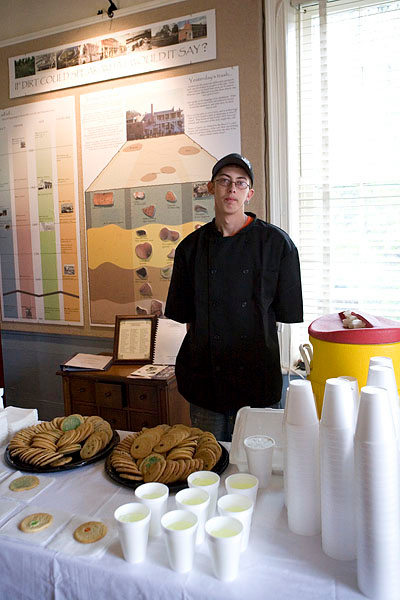 Even the young man who catered the event had an interesting war story in his family history. He told my father that his grandfathers were Nazis who served in the German military during WWII. The most memorable part of the day for me was during the opening ceremony. 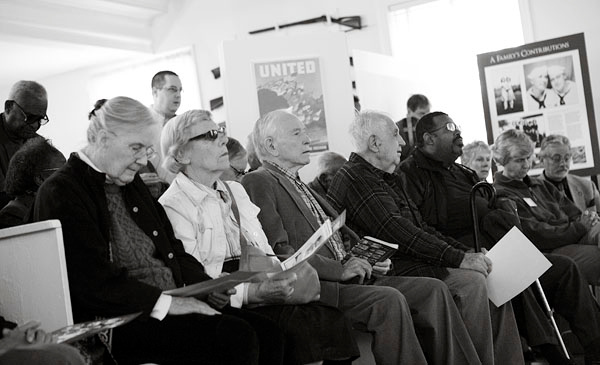 Several veterans and their spouses sat in the front row. 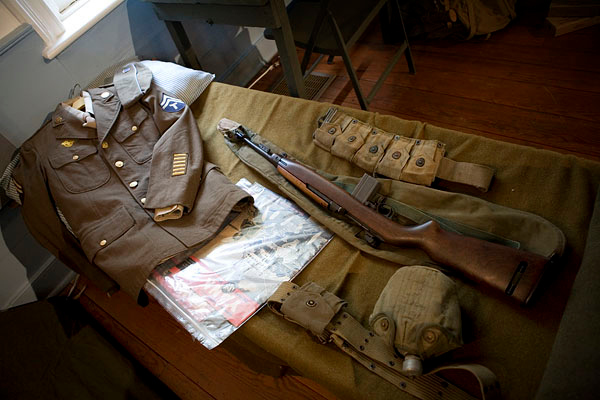 During the opening presentation, the museum played a recording of Roosevelt’s “Day of Infamy” speech. I had heard the speech before, but I never really understood the impact that it must have had on people during that time. 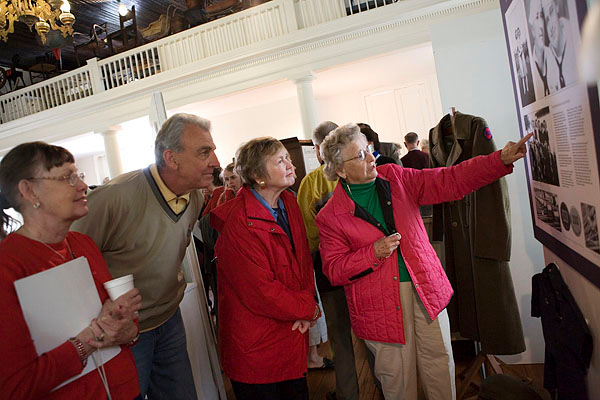 As soon as Roosevelt’s voice filled the museum, the older members of the audience sank a little lower in their seat, hung their heads, and closed their eyes. I could look in their faces and see that they were remembering that day. For the first time, I could imagine what it must have felt like to hear that the US was about to enter the war, and the impact it would have on individual lives. This moment was chilling and powerful. My photos don’t do nearly a good enough job to capture it. Another picture during the “Day of Infamy” recording. 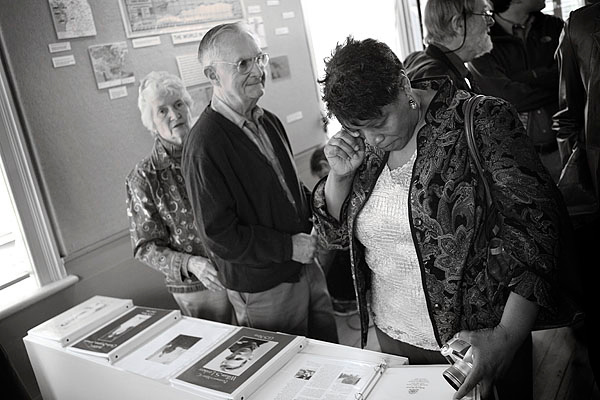 A veteran’s daughter wipes a tear while reading another vet’s story. 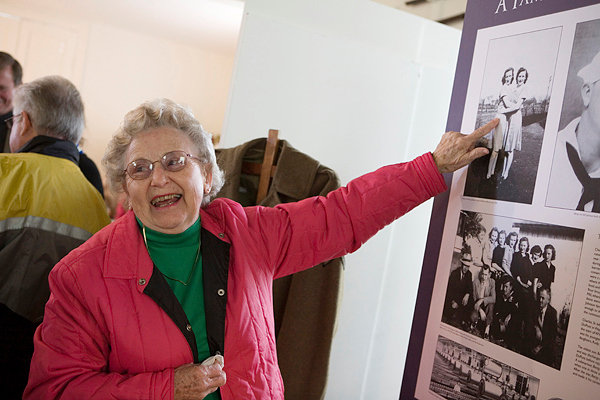 Rudy Shumaker shows some museum guests the exhibit poster about their family. This couple was thrilled to discover that the woman in the poster they’d been reading was standing right next to them. 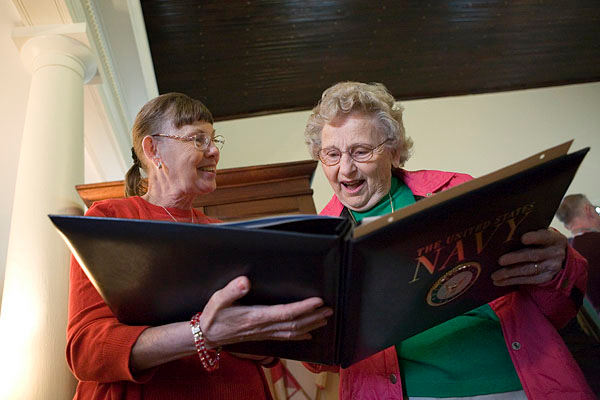 Jill Harwood shows her aunt, Rudy Shumaker, a scrapbook that she made about Gilbert Johnson’s service in the Navy during WWII. 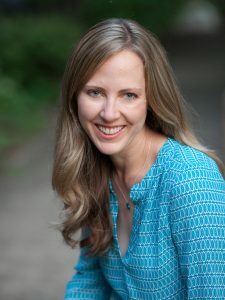 Gilbert Johnson was Jill’s father and Rudy’s brother. 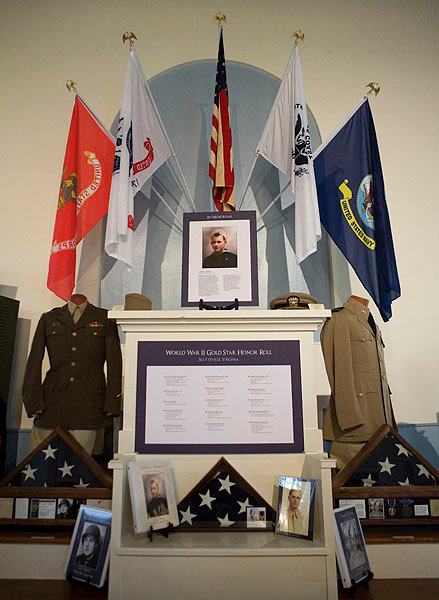 To see more about the veterans from Scottsville, you can go back to this blog post. That’s an incredibly sad, yet awesome, museum. 🙂 You did an awesome job with the photos. Absolutely brilliant! I love the emotion on all their faces! You did a great job! thanks for allowing us to be there through your photos.